One of the key features of our Hydrogen WordPress hosting service is the separation between the frontend / www of your site hosted with us and the backend / WordPress dashboard. This enables you to avoid many possible downtimes due to syntax errors, bad plugins or the wrong theme. Therefore if anything goes wrong on the WP dashboard area (wp-admin), the public site is showing the latest cached version of the site. We are happy to announce today an update to our service that speeds up the entire dashboard area and thus makes it more responsive to every click and action you perform. We have tested extensively the keepalive feature introduced in nginx version 1.1.4 and now are making use of it. In other words the servers running the wp-admin area are in permanent connection with the frontend servers that are running the public site. So every action you perform on the WordPress dashboard is sent faster to your browser (editing/publishing posts or pages, various settings you modify or even the load of the wp-admin home page). Simply put, your WordPress dashboard is around 100ms more responsive than it used to be until now. 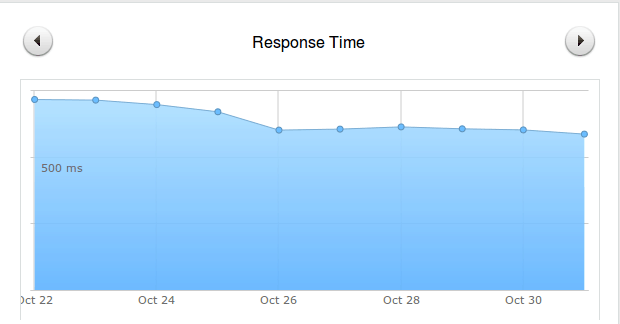 That is a response time improvement of about 15% throughout our customer base and we consider that having a faster WordPress dashboard is a win for everybody.